After a good night's rest at the Surf Motel and Gardens in Fort Bragg we drove down to the station. We pulled into the Fort Bragg California Western parking lot and the first thing I saw was an old friend. 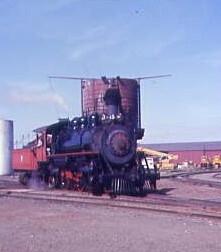 Sticking its front nose of the Fort Bragg engine house was California Western 2-8-2 45 built in 1924 by Baldwin. The railroad was originally built by the Fort Bragg Redwood Company as the Fort Bragg Railroad in 1885 to carry coast redwood logs from the dense forests at Glenela (Glen Blair) to a newly built lumber mill located 6.6 miles (10.6 km) to the west at coastal Fort Bragg, California. Fort Bragg Redwood Company was incorporated into the new Union Lumber Company in 1904; the railroad ownership always rested with the parent lumber company until 1969. On July 1, 1905 the railroad was renamed the California Western Railroad & Navigation Company. In 1904 passenger service was added, and on December 11, 1911 the route was completed to its total length of 40 miles roughly following the Noyo River, to interchange connection with the Northwestern Pacific Railroad in the inland town of Willits, California. On December 19, 1947 the railroad name was shortened to the California Western Railroad. 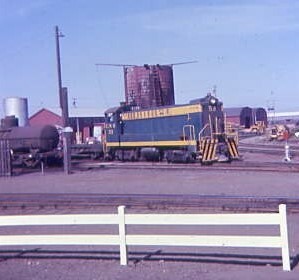 Union Lumber and its California Western Railroad came under the ownership of the various lumber producers, including Boise Cascade (1969), and later Georgia-Pacific Corporation. 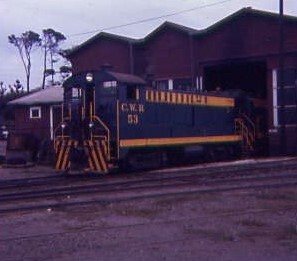 G-P initially leased the CWR's operations to Kyle Railways, but in June 1987 the CWR was sold to the Kyle Railways subsidiary Mendocino Coast Railway. Mendocino Coast Railway continued to operate the CWR under the California Western name. No longer able to make a profit when the G-P mill began to reduce operations and finally closed altogether, Kyle Railways opted to sell the financially starved CWR. On December 17, 2003 the California Western Railroad was rescued when it was bought by the Sierra Railroad. Today the Skunk Train is owned and operated by Mendocino Railway. I picked up my set of tickets and went out to photograph the steam engine coming out to get put onto our train. The water tower still remains and is in use in Fort Bragg. The California Western Station in Fort Bragg. The California Western mural in Fort Bragg. The California Western water tower in Fort Bragg today. A blast from the past. These pictures from 1974 shows the huge Georgia Pacific lumber complex in Fort Bragg that is no longer there today. Now let us watch the California Western 45 make her morning debut in Fort Bragg today. What a great show of steam as the California Western 45 came out then backed onto our train set this morning. My mother switched the tickets. After I had talked with a CWRR employee I went back in and got out final tickets. Steam train to Northspur, Skunk Motorcar to and from Willits then the diesel train from Northspur back to Fort Bragg. Now I would not have to worry about driving to Willits on Ca Highway 20 to make a train. I picked my spot in the open car and would now start my second trip over the entire California Western Railroad. At 10 AM the trip started with the usual side blowing to release the built up steam from its boiler. We left the very attractive California Western Fort Bragg station behind. Well wishers as the train took the first of the many curves it would take on the way to Northspur. The train crossed Pine Street in Fort Bragg. One last look at the California Western Fort Bragg station. The train crossed Main Street aka CA Highway 1 in Fort Bragg. The train dropped down the grade to reach Pudding Creek with the trees on the other side of it. The train dropping through a curve down to Pudding Creek. More trees along Pudding Creek. A look up Pudding Creek. The train took a curve along Pudding Creek. A view of Pudding Creek. Our train took two more curves. A view looking from the open car. It was announced that all passengers would have to come in from the open car due to falling rock in Tunnel 1. I told my conductor what I wanted to do and he said that was fine with him. The train took another curve on the line. The empty open car is a lonely place with no passengers in it. The train curved into Tunnel 1 which is 1,184 feet long and was built in 1893. It cuts through the ridge between Pudding Creek on the north and the Noyo River on the south. The train entered Tunnel 1 and I went inside with my conductor. My next two pictures were taking through the car's end door windows. The train exiting Tunnel 1. I returned outside to continue my trip photography. The train took the first curve out of Tunnel 1. The rest of the train exiting Tunnel 1. The train took some more of the curves on this railroad. Many old growth Redwood trees are found along this railroad. Another curve took the train into South Fork. The South Fork station sign. An old Redwood tree stump. This is one of the oldest Redwood trees in the forest. Always remember to look up when riding in an open car on any railroad that runs one of them! An old side dump ballast car found near Rockpit. The train crossed Bridge 7.11. The mighty trees of this forest. The train took another curve on this railroad. The train crossed the Noyo River. The train crossed the Noyo River again. The train took yet another curve on this railroad. Remember to always look up in an open car. The top of one of the trees. The train took another curve on the way to Northspur. At Camp Mendocino a Big Foot or sasquatch wood craving. The train ran by Camp Mendocino. The train took another curve before we reached Northspur. At Northspur we would transfer to the Skunk motorcar. I detrained at Northspur. My mother being lifted off of the steam train. We made our way to the boarding location for the Skunk motorcar. We said our goodbyes to my old friend California Western 2-8-2 45 at Northspur. He would back his train out of the way so that the Skunk motorcar could load before the steam engine would be wyed for his return trip to Fort Bragg. The Skunk motorcar was waiting across the Noyo River Bridge 21.31 at Northspur. It then backed into boarding location. California Western Motorcar M100 would be my ride to Willits and the back to Northspur for a BBQ dinner on the way back to Fort Bragg. My mother was lifted onto the California Western Motorcar M100. The inside of the California Western Motorcar M100. I took the front seat for my trip to Willits. My California Western Motorcar M100 operator for today's trips. We left Northspur by crossing the Noyo River Bridge 21.31 heading for Willits. One of the passenger shelters along this railroad. We went by the Northspur Yard Limits sign. The grade has begun to increase as we head east out of Northspur. A short piece of straight track on our route.